Bright and early this morning I made my way over to Irving school to help put together Tuesday packets. This was my first foray into packet making and I respected the hierarchy of the job; you don't become a stapler until you have spent some time collating. There were about ten pages in each of the 360 packets and when finished putting them together I felt like I'd been floating in a raft on wavy water, but he best part was all the fun conversation! My friend and blog stalker, Jules, passed along a fine bit of wisdom during our conversation today after someone came in late hoping to add a page to the packet...life has taught her, "your poor planning does not necessitate my emergency." Man, I wish someone had taught me that to me earlier in life! She is a wise woman. From the school I snapped up my neighbor Eileen and hit the Eastgate Cafe on Harrison for an early lunch and a chat. 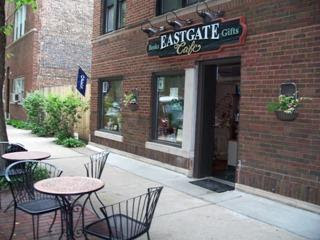 I had not been to this cute cafe yet and really enjoyed the company and my pulled pork! I also took in a little acupuncture treatment later in the day. I am happy to report I finally graduated to a face up treatment...normally I am flat on my face with a dozen or so needles in my neck and today I had one right between my eyes! In a strange twist, while waiting for Emma to get out of school, I witnessed a middle school girl get hit by a car. It was one of those bizarre audio moments; I heard the tires squeal...familar...and then I heard the odd thud...not so familiar...and then there was a scream. Nobody ever thinks that will happen so, audio or otherwise, I was not prepared. I hope the girl is okay. The police were on the scene in under a minute. After collecting both kids we ventured to the Leo's warehouse to pick up Nutcracker shoes. I found it funny that Emma, who normally wears pink shoes, needed black shoes and Finn, who normally wears black shoes, needed white! What is this? Financial sarcasm? We ended the evening with a lovely family dinner with the kids and later enjoyed some champagne and cake at neighbor's beautiful home. Yet another day in the OP! Oh dear! Is the little girl okay? Scary! I nearly got hit by a pick-up a couple months ago. You have to be so careful. I hope this girl is ok.